All the usual suspects...Earth Balance, Tofutti Sour Cream, Daiya Pepperjack, and chives. Yeah, that about sums up my weekend. mmmmm that looks so good! It does look good. Yum! Sounds like the perfect weekend if that's how to sum it up. Uhhhhhhhhhhhhhhhhhhhhh... that is so hot. 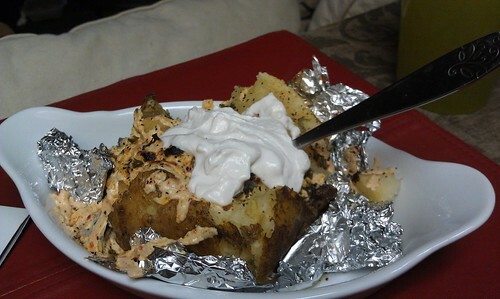 Why do I never think to eat loaded baked potatoes? One of those super easy amazing foods that go neglected in my house. Yours looks delicious!